PopClip is a small utility for OS X from PilotMoon that gives you an iOS-like multifunctional popup menu when highlighting text, described as a faster, easier way to work with text on your Mac. Having used it for a week now, it seems like a natural extension of OS X and really makes certain tasks easier. It’s hard to imagine ever not having it around. For anyone who spends a lot of copy pasting small fragments of text, web addresses and emails – this is an absolute must-have utility. 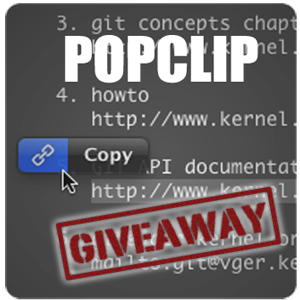 PopClip is available from the Mac App Store for $4.99 and will work with Mac OS X 10.6 and above. It adds a small pop-up menu when you highlight text, similar to how it might on your iPhone or iPad. The default actions are Cut, Copy, Paste and Search, but there’s also a number of context-sensitive items that appear depending on the upon the text selected. I’ve found the Search icon to be the most useful to me. Instead of copying the text, opening a new Chrome window, pasting the search term in and hitting enter – it’s just a single click to do it all. This feature alone is worth it for me. If you highlight a single word, a dictionary icon is also shown. Though OS X Lion includes a lookup function on the option menu, I found the PopClip action to be slightly faster to open the dictionary app, as well as removing the need to right-click to open a context menu. If you highlight something resembling a URL, a link icon is shown – one click and the URL will be opened in your default browser. The link doesn’t even have to include www or http://, as PopClip intelligently works out that something is a URL, even with obscure top-level domains. Naturally, when highlighting an email address, a send email button is displayed! Cut, copy and paste operations are all faster with PopClip; instead of reaching for the keyboard, it’s a short click away so you needn’t lose your focus on the screen. Click anywhere that accepts text input, and the little paste button will appear. Spell-check functionality is also included. PopClip also has an user-definable exclude list so you can turn it off on a per-app basis if it’s interfering, though I haven’t found a reason to disable it anywhere yet. Other options allow you to adjust the size of the popup, and disable any contextual buttons you don’t need. There’s a free trial available so download PopClip and test it out. It’s $4.99 from the Mac App Store if you’re thinking of buying. I've heard about this app, but I am always curious about it. The thing is trackpad gesture has done a very decent job, why go for a 3rd party app like this for some additional functions which seems to be a rip-off of the brilliant iOS? But I have seen your point, the app will give you more flexibility in a very iOS-user-friendly way. It is definitely tempting for every iOS user to do spellcheck and search in a popup menu. I am not a fan of secondary click anyway. And there is so little we can tinker and tweak in System Preference. I hope this app will bring us a fresh air.